A country's leader is the country's own fault --- an Iraqui exile. I've seen the pictures [of the looting of Baghdad's archaeological treasures]. I could take pictures in any city in America. Think what's happened in our cities when we've had riots, and problems, and looting. Stuff happens. ---Donald Rumsfeld, one of the advisers the American people's leader, George W. Bush, has surrounded himself with since the day he took office. Things didn't look promising for a quick and happy outcome of the invasion of Iraq two and a half years ago when Brian Clover reviewed the London opening of David Hare's Stuff Happens. When Laura Hitchcock reviewed it in Los Angeles nine months later, the war that was supposed to establish democracy for the oppressed Iraqi people wasn't any closer to achieving its aims. The situation was best described by Groucho Marx's definition of politics as "the art of looking for trouble, finding it everywhere, diagnosing it incorrectly and applying the wrong remedies." Fast forward another year, and now Stuff Happens has opened to a sold-out run at the Public Theater. The war continues to exact an appalling toll of lives and resources, and the increasingly troublesome insurgency looks more and more like a full scale civil war. The documented speeches in Hare's play are chilling to hear again and the imagined scenes based on his interviews with people close to the powers that be are no longer daring suppositions -- even the most outrageous ones having proved to be eerily factual. As a matter of fact with an op-ed piece by Paul Krugman from Monday's New York Times warning readers not to dismiss the possibility of George W. Bush and his colleagues planning yet another preemptive war at my side as I write this and Seymour Hersh expressing similar concerns in The New Yorker, real life seems to have overtaken Mr. Hare's play. Hare is a good enough playwright to juice up his depressing dossier of how linguistic trickery pushed through the means for a war with too few troops and supporters with enough biting humor and vivid characters to turn the stuff he shows happening into a trenchant theatrical experience. Mind you, this is not a comedy to make you go home mellow and relaxed, however. Most likely, if you've nabbed a ticket, you will be familiar with the play's litany of missed opportunities and reckless political maneuvers so that this dramatized replay of remembered and forgotten details and players will sledge-hammer it all together. Thus, the funny behind closed doors stuff conjured from Hare's imagined take of the interviews he conducted will be less revelation than relief from the sense of impotent anger this deadly serious "stuff" stirs up. While remaining mum about dad, Bush amusingly jokes about mom's cooking ("She never cooked. That woman had frostbite on her fingers. Everything out of the freezer"). You're also likely to chuckle at seeing Bush's brain trust portrayed as belligerent boneheads -- especially when they inspect George Tenet's fuzzy evidence of factories of mass destruction and Rumsfeld buffoonishly endorses its clarity with "even I can see, and I'm nearly seventy." But this is gallows humor and doesn't change the fact that their real life counterparts remain in power. Stuff Happens offers no plan for a more hopeful scenario but simply lays out the facts with as much dramatic heft as this combination docudrama/history format allows. Fortunately, the current production, like the two previous ones (linked below), is bolstered by strong direction, well-considered staging and a mostly persuasive cast. In fact, Daniel Sullivan is one of New York's most sensitive and able directors. Scenic designer Riccardo Hernandez has helped him to reconfigure the Newman theater so that the stage is a runway in the middle of what's usually the usual orchestra section. This puts an extra burden on the actors in terms of facing both sides of the orchestra but Sullivan keeps all sixteen of them moving around in interesting ways. And while there are somewhat too many sequences when both sides of the audience see the actors only in profile, this seating arrangement does have the advantage of putting everyone close to the stage (with no seats further back than what I believe was the eight or ninth row) and connects them more intimately to what's going on. (For some details about what was involved in the reconfigeration, see the bullted notes at the end of the Production Notes below). The playwright, who's in New York for the opening of this production and has been freshening up his script with more timely references, and some refinement of Powell and Blair's characterization. However, the play overall is basically unchanged and its characters are modeled on the same drawn from life players and events already covered at length by our London and Los Angeles critics. 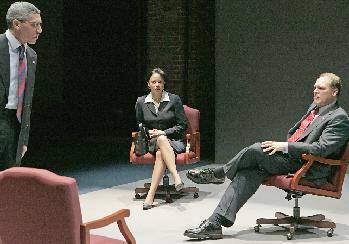 Gloria Reuben is a remarkably look-alike of Condeleeza Rice, the loyal advocate who speaks for him, but never herself, the way a protective mother steps in when a child has trouble getting a thought across. When she does sum herself up at the end it's with a hilariously deadpan "I'm determined to leave this job without anyone figuring out where I stand on any major issue." None of the other actors look especially like the people they're supposed to be. Except for J O. Sanders and Byron Jennings who play George W. Bush and Tony Blair respectively, none seem too fixated on capturing the voices and gestures of their role models. Sanders exudes a sense of a syntax-challenged, genial good old boy. While his born-again tunnel vision and limited intellectual muscle have kept him in the tight embrace of his inside circle of advisers, he comes off, as the playwright intended, as shrewd enough to get the upper hand over both British Prime Minister Tony Blair and Secretary of State Colin Powell. Byron Jennings (as Blair) and Peter Francis James (as Powell) bring genuine passion and conviction to these men who, for lack of any real heroes, come as close as anyone on stage to filling those shoes. Jeffrey De Munn substitutes daffyness for Rumsfeld's gobbledygook feistiness and Zach Grenier's sneer falls somewhat short of the much more snappish Cheney's twisted upper lip. If their portraits and those of several other Bush cabinet members seem drawn with garish Dayglo markers, it's as if Hare can't bring himself to believe that really bright men can blunder so egregiously. While the cast is too large for me to comment on all, I couldn't help wondering why Karl Rove, Bush's Eminence Grise was eliminated. Typical of sizeable ensembles, some of the best performances can be attributed to the actors playing secondary characters, many of them handling multiple characters -- Brenda Wehle is a stand out as a British politician, Laura Bush and ensemble speaker; Robert Sella is terrific in a long monologue delivered as an angry Robert Novak style conservative reporter. He's so entertaining as Dominique de Villepin of France that you can forgive the overly long diplomatic luncheon that serves as a set-up for the UN meeting on war sanctioning resolutions -- and the fact that Hare's depiction of the Frenchman hardly jibes with his real life stature as a published writer and intellectual. Like most plays that have been written since the September 11th events that turned George W. Bush from a floundering president into a war president, convinced that God was holding his hand, Stuff Happens should be seen by people for whom this would all be pretty new stuff. The statement most likely to linger in audiences' minds comes from the Iraqi exile (quoted at the top of this review). This man, who happens to provide the play with its most emotionally resonant scene, sees his country's biggest sin as failing to take charge of itself and thus allowing the worst person [Saddam Hussein] to take charge of itself. He might well be talking about the United States citizens who twice elected George W. Bush, who though a far cry from a crazed, sadistic dictator, was hardly the wisest choice to lead this country at a critical time. One can only hope that they will remember that exiled man's "a country's leader is the country's own fault" the next time they enter a voting booth. Maybe then the stuff that happens will not include a multi-trillion dollar debt or a life expending, difficult to end slam-dunk war. The show, s originally scheduled to close on April 30, was extended to June 25. It was nominated as Best Play by both the Outer Critics Circle and Drama Desk Awards. In addition, the Drama Desk has given the ensemble cast a special award and nominated Daniel Sullivan as Best Director. Three roles were substituted for the extension of the run as of 5/16/06: Reed Birney as British Prime Minister Tony Blair; Tony Carlin a Jonathan Powell and Robin Cook; and LarryPine as Secretary of Defense Donald Rumsfeld. The reconfiguration of the Newman Theater was the design concept of the director and the designer. Dan Sulllivan wanted the stage to feel more intimate and pull the audience closer into the action. An architect was brought in to redesign the space and permits had to be obtained from the city for building new seating where the stage was. The process took 6-8 weeks. This makes the third "new look " for the show which was in the round in London and two-level in LA. The actors not only had to play to two sides but be careful of the audiences in the first rows.